Were Jesus and Mary Magdalene on Iona? Does Edinburgh contain a geomantic ground plan for the New Jerusalem? The mysterious Mount Heredom and the White Isle of Shambhala. You are to be congratulated in producing such a work which I find so fascinating, well researched and referenced. Your efforts in ultimately producing ‘Vision of Albion’ will have widespread commendation.” – Ian Wright, Scotland. “In Vision of Albion, Barry Dunford extends the argument he put forward in The Holy Land of Scotland, with thanks to the mystic poet William Blake to whom Albion, the British Isles, was the ‘true Holy Land of Christ’. Informing him is his uncovering of a groundswell of esoteric truth behind the existence and mission of Christ on this Earth. Dunford’s starting point centres around the 1906-dated stained glass window in Kilmore Church on the Scottish Isle of Mull, which depicts a haloed Jesus with a pregnant, girdled woman, apparently Mary Magdalene. Such depiction pre-dates latter-day discussion that the two were married. As a result of deciphering clues from gaelic placenames, together with well established traditions and legends, Dunford’s research supports the Blakean thesis of Christ’s presence in the British Isles. 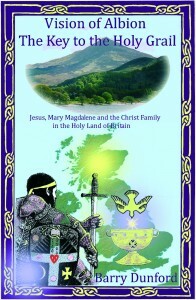 More than this, Dunford shows that other members of the Holy Family, including Mary, the Mother of Jesus, Mary Magdalene and Joseph of Arimathea, may have visited the British Isles. If this was the case, then what might have been the reason for their coming from the Middle East, as far as the Blessed Isles of the West? What Dunford’s research shows is that the Holy Family were very likely related to the contemporary royal lineages of Britain, in particular the Silurian royal household whose kingdom, at that time, appears to have stretched from present day south Wales to as far north as the south west of Scotland. Furthermore, there may have been a common gaelic ancestry between the old British royalty and the Jesus family from Galilee in the Middle East. Dunford further records that the entire cycle of legends which has the Holy Grail for its centre is concerned with Britain and Britain alone, and he asks: “Could it be that Great Britain is the holy grail of future spiritual revelation?” He also quotes sources which identify the Holy Grail corpus with the tradition of the hidden Shambhala. Incredibly, perhaps, Dunford’s investigations suggest that the famed Shambhala, the abode of spiritual master beings said to be overseeing the evolution of the human race, is not located in the region of the Asian Himalayas, as is traditionally believed, but rather is located within the sacred Isles of Britain, William Blake’s Holy Land of the West. As far fetched as this may seem, Barry Dunford’s well researched overview tends to reinforce such a contention as a distinct possibility. Interestingly, a Scottish journalist, Comyns Beaumont, has remarked: “The ancient island of Britain is the key to world history in the past and she will be in the future”.